Gorgeous visual profiles of 50 trailblazing science pioneers. Love your world? Thank these women! Maybe you’ve heard of Marie Curie or Ada Lovelace. But what about the rest? There’s 17th century scientist and illustrator Maria Sybilla Merian, who went all the way to the rainforest to draw butterflies and other wildlife. There’s daredevil Katia Krafft, who studied volcanoes (and died in a lava flow). Or how about Katherine Johnson – the African-American NASA maths genius who figured out the path of the Apollo 11 Moon Mission? 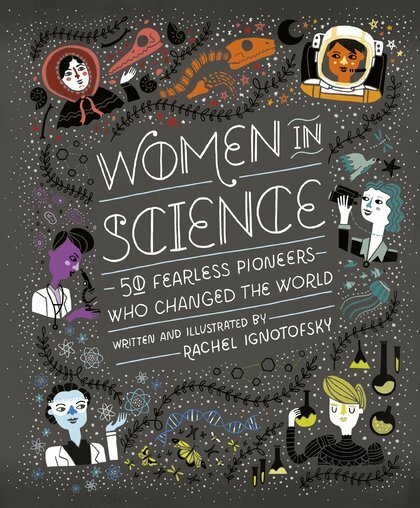 Brainpower, bravery and beauty: they’re all in this book of brilliant science!